Sushi is quite delicious, and it can be hard to give up when you’re pregnant. But do you have to give up eating sushi in pregnancy? Most experts will tell you to give up eating sushi completely in pregnancy. The risk of bacterial infection is too high. However, there are also a handful of healthcare providers that don’t see anything wrong with eating sushi when you’re pregnant. And the type of sushi that you’re eating (i.e. cooked sushi or sushi made with raw fish) also plays a role in answering the big question – is eating sushi in pregnancy safe or not? You must make up your own mind, but here are the reasons for and against sushi consumption when you’re pregnant. 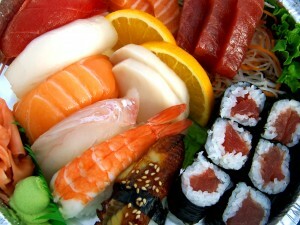 In the United States, many dietitians and obstetric healthcare providers argue that pregnant women should not eat sushi. Cooked sushi is considered safe, but raw sushi can harbor bacteria and parasites (such as tapeworms). Getting a tapeworm infection in pregnancy can make you sick, and it can rob your body of nutrients that both you and your developing baby needs. Since your immune system is suppressed in pregnancy (so that your body doesn’t mistakenly attack your developing baby), you are at higher risk of getting sick. Food-borne illnesses can be mild or severe, but when they’re severe, they can lead to miscarriage and other pregnancy complications. Although your risk of getting a parasitic infection from eating raw sushi is low, most experts want you to be safe and not take the potential chance. Most likely, a parasitic infection can’t get pass the placental barrier, but it can cause liver or gastrointestinal problems for the mother, which then could affect her child. Sometimes, parasitic infections can lead to anemia or malnourishment, and this can have disastrous affects – such as causing a miscarriage. Experts also caution pregnant women against raw seafood, due to the mercury levels. For example, you’ll want to avoid certain types of fish and seafood – such as shark, tile fish, swordfish, and king mackerel – in pregnancy, since they contain potentially dangerous levels of mercury. The safety of sushi in pregnancy is actually a highly debated topic, believe it or not. According to supporters of eating raw sushi when pregnant, most of the fish and raw seafood served in restaurants has been “flash frozen” (a process in which fish is frozen to extremely cold temperatures within hours of being harvested). Flash freezing kills any parasites that the fish might harbor. The Food and Drug Administration (FDA) actually requires all fish that are eaten raw to be frozen first in order to kill parasites. Another reason why sushi shouldn’t be a problem in pregnancy – Japanese women eat sushi made with raw fish, and they have healthy babies. This is definitely a personal issue. Cooked sushi is fine – there’s no debate over that. However, it’s up to the pregnant woman’s discretion whether she’ll eat raw sushi when expecting. Some women don’t like to take any chances, since your developing baby is so vulnerable. The decision is up to you. What do you think about sushi in pregnancy? Would you rather be safe rather than sorry? Or do you think the risk is so low that if pregnant women are craving it, they should eat it? I love it when people come together annd share opinions. match. You could use interval training with all phases in theprocera avh to boost your results. following to keep your body properly hydrated. So instead of walking at a steady pace for say an hour, you’ll change matters up by alternating brief bursts of extreme strolling for say a minute followed by a recovery period with slower strolling following every extreme time period. Just retain alternating for 20 minutes to start and add time while you come to be far more fit. You could use interval instruction with all phases from theprocera avh to boost your effects. Also any time you do any form of physical exercise it is actually strongly encouraged you drink lots of water ahead of for the duration of and right after to keep your whole body properly hydrated. Truly, fantastic posting! Kudos for sharing. I do have a couple questions for you, so I’ll look for your email and email them directly if that’s okay. Hi, u have a nice blog. Anyway, i followed u, pls follow me back. Also, I have Independence Giveaway, free stuff, check it out..thanks.. I LOVE sushi… however – some of it does make me a little uncomfortable during pregnancy. But that doesn’t mean I stop eating it, I just opt for the cooked rolls instead. I can devour the veggie, california and crunchy shrimp rolls… and the great thing is (aside the the crunchy on the shrimp) is that EVERYTHING in the roll is good for you – especially while pregnant! Your blog is fantastic. So informative. I’ll be reading frequently! I totally stayed away from raw sushi when I was pregnant. Then a friend told me she ate some and was fine. I always wonder if the Japanese moms ate raw fish when they are pregnant. But I rather play it safe – even though I love raw sushi so much! By the way, I’m following you – it’s a great informative site! I’ve never tried sushi but I have heard that it shouldn’t be eaten in pregnancy. Then again, I read one time that mascara could cause cancer. I refuse to give up mascara :). You know I will keep you updated and post pics of the new little one! Good!!! I am really looking forward to your photos! Hope your house gets rebuilt soon in time for your new one! Those tornado photos looked awful! / As it is a Trial & Error version, just to test, there’s some problem.. I also suffered it.. But, never mind, you can uninstall the Pro version & instal Home* Free version. The effects work smooth in free version too…. *Download VDJ V 7.0 or later. Hope this helps! Birds are also mistreated. I have a cockatiel that I adopted from the Humane Society and to all my previous birds, I was their 2nd and forever home. Birds are notorious for self mutilating. They will pluck their feathers out and actually get down to the skin and make sores when they are left alone too much or mistreated. Some can actually have mental issues for that very same reason. People should do their homework and realize that they are responsible for a life. Humm…I am staying away although I miss it so much because no matter the debate I just don’t want to put myself at any risk big or small. That is definitely a good decision!!! Next post: Ear Piercing in Babies: Should You Pierce Her Ears?